Antrim's Michaela Walsh is the new featherweight Chemistry World Cup champion. The EU titlist beat India’s World Youth gold medallist Sakshi Choudhary on a unanimous decision to top the 57kg podium in Cologne,Germany this afternoon. 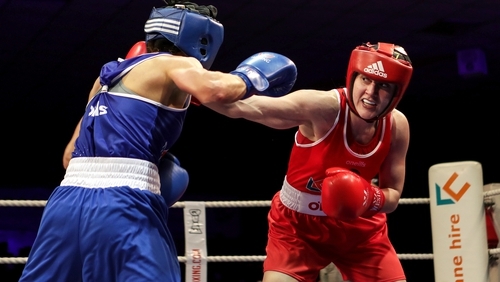 Boxing well within herself, Walsh won all three rounds. Earlier today, Antrim’s Carly McNaul had to settle for silver after an extremely close flyweight final with Armenia’s Anush Grigoryan. Dublin heavyweight Tony Browne lost to Muslim Gadzhimagomedov in the heavyweight decider. The Russian, who was beaten by Joe Ward in the 2017 European light-heavy final, had his hands full with Browne in all three rounds before taking a points decision after an open and tactical contest. Ward had to make do with bronze after a controversial semi-final split-decision loss to home fighter Abu Lubdeh Abdulrahman at light heavyweight on Friday.